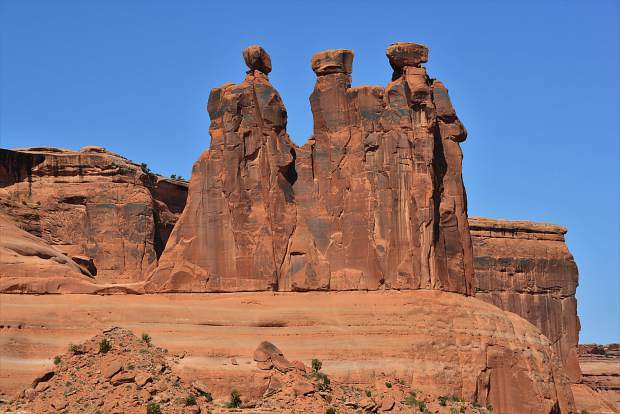 The Three Gossips formation is among the Courthouse Towers near the entrance to Arches National Park outside of Moab, Utah. When the ski resorts close for the season, hikers become anxious to begin exploring from the forest to the highest summits. However, many trails above 9,000 feet are still covered in deep drifts of wet snow, obscuring blazes that mark the way. This makes spring an ideal time to seek adventures in the lowland desert areas of the southwest. After watching the daily high temperatures in the desert reach 80 degrees, I packed for an adventure of unknown composition. I froze eight liter-bottles of drinking water, adding a few more containers of water to fill my insulated carrier. I also brought a thermal jug to fill with a bag of ice during the trip to maintain my supply of cold water. I added cereal, instant noodles, coffee packets, nuts and trail bars for quick meals on the move. Basic camping gear is a permanent stash in my car: stove, tent, tarp, sleeping pad, sleeping bag and down jacket. I drove a few hours west on Interstate 70, passing Grand Junction, and decided to find a quiet place away from the heavily used campgrounds near the Colorado National Monument. I drove a half-dozen miles north of the freeway, passing irrigated fields and flocks of sheep, to reach Highline Lake State Park. Although the sun was low in the sky, I found only a third of the campsites were filled for the night. After assembling camp and taking a stroll along the shoreline of the reservoir to the air tones of an owl settled in the upper branches of an old cottonwood, I burrowed into my sleeping bag for a good night of rest. Off to an early start, I soon was at the entrance of Arches National Park. I wound my way above Moab Canyon and passed the Three Gossips — pillars of rock among the Courthouse Towers. I hiked 2 miles to circle Balanced Rock, Double Arch and the Windows. Then, I proceeded to the northern extremity of the park and parked at the trailhead to Devils Garden. The Devils Garden provides 7 miles of hiking trails to seven significant arches among a large field of rock fins overlooking Fin Canyon. The first 2 miles of trail are a smooth, wide, well-developed, nearly level path that reaches Landscape Arch. Landscape Arch is the longest span, a thin and smooth arch measuring 306 feet across. A rougher trail gradually ascends to Partition Arch, a picture frame bored through a red rock fin that offers a dramatic view of distant desert plains dappled with clumps of pinion pine. Above Partition Arch, a path leads through the sand to Navajo Arch, a cool, sheltered, cave-like formation that frames a gnarled ancient pine tree. As the main trail proceeds northwest beyond the first three arches, the steep climb up a slick rock rib separates the casual walkers from more fearless and experienced explorers. These folks must carry adequate water into the desert furnace. By the time I crossed the second exposed rib and took the steep drop into the sunken pocket where the Double O Arch resides, I had consumed the first liter of ice water from my daypack. On the trek back to the trailhead, I finished a second liter of water. The flattened oval holes of the Double O Arch are small, dramatic sculptures eroded from a fin of sandstone hovering 40 feet above the plateau floor. After resting in the shade of the fin for a few minutes, I completed my tour of the Devils Garden with side trips to the small Pine Tree Arch and Tunnel Arch before returning to Moab for the evening. On entering the bustling town of Moab, I instantly regretted making a reservation at a private campground resort immediately south of the community. Highway 191 carried thousands of growling Jeeps and jake-braking semitrailers through the night, the noise reverberating against the canyon walls like the pluck of an acoustic guitar. I set camp on a red clay pad the size of my tent, with a row of 10 tent sites tightly packed into a narrow trench below a parking lot. Despite waking a few times to the sound of a roaring truck passing through the canyon, I did get a good night of sleep and rose early to prepare for new adventures. Although there are a dozen private campgrounds conveniently located in the immediate vicinity of Moab, I hope to visit a more remote site if I ever return. An hour northwest of Arches National Park is Green River State Park on the shore of the Green River, with tent sites on a grass lawn in the shade of cottonwoods. However, campers there can hear the noise of freight trains through the night. West of Moab Canyon, 40 minutes from the arches, is Dead Horse Point State Park. This desert campground overlooks the Colorado River near Canyonlands National Park. On my second day in Arches National Park, I drove directly to the trailhead for the Delicate Arch. Delicate Arch is probably the best known of the arches, hanging over a slick rock cliff about 500 feet above the valley floor. The trail passes the remains of a one-room cabin inhabited by John Wesley Wolfe at the end of the 19th century. Native Americans occupied the area thousands of years earlier, leaving petroglyph artwork on the rock walls as evidence of their presence. After a long ascent on a broad uplift of sandstone, the trail to Delicate Arch wraps around a fin on a narrow ledge above Winter Camp Wash. I scrambled over the rim of the circular amphitheater of smooth rock at the base of Delicate Arch to enjoy varied perspectives of the scene. Then, I emptied a liter of ice water and began my retreat from the sun-beaten rock-scape of Utah. The entrance to Arches National Park is 5 miles north of Moab, Utah. Moab is about 280 miles from Summit County. On I-70, travel westbound for 260 miles, then turn south onto U.S. Highway 191 and travel south for 20 miles. The trip takes 4.5 hours, including a few quick breaks along the way. The trip to Highline Lake State Park, north of Loma, Colorado, is less than 200 miles and takes three hours. From I-70, travel to Colorado 139 North, Exit 15. Drive 5 miles north before turning west on Q Road for a mile, then head north on 11 8/10 Road to the entrance of Highline Lake State Park. Author Kim Fenske has written extensively on hiking trails in Colorado. His writing includes, “Greatest Hikes in Central Colorado: Summit and Eagle Counties,” and “Hiking Colorado: Holy Cross Wilderness,” both available from Amazon Kindle books.